In an emergency situation, specialized sterile surgical staples can be used in place of sutures to close skin wounds. Using staples to close skin wounds can be a safer alternative for wounds that can be stapled. Stapling is much faster than suturing by hand, and is typically more accurate and consistent. This surgical skin stapler is disposable and comes with 35 sterile preloaded staples. This stapler has indicator numbers on the side or top (depending on the model) to give you an accurate count of how many remaining staples are left. It's simple design provides consistent and reliable performance. It is designed to fit comfortably in your hand to enhance control of skin closure and reduces surgery time. This surgical skin stapler has a short trigger pull range for ease of use and nonstop feeding of the staples. The stapler design includes an arrow indicator and angled head that provides a clear view of the incision to ensure precise staple placement. Make sure the wound is cleaned out before stapling. You must have a skin staple remover to pull out the staples after the wound has healed. If you use anything else to pull the staples you risk damaging the wound. In skin closure, some less significant skin wounds can be closed with butterfly strips or dermal adhesives (skin glues). Practice using a surgical skin stapler with two person (one holds wound edges and the other staples). Then try one person use - pick up one side of the wound with the first click and pull it toward the other wound edge before fully stapling. This is definitely faster than amateur suturing but still need to know what wounds you can close and how to prep a wound. It may be easier in some instances to close the wound with tissue forceps such as Adson forceps. See the video below on using a surgical skin stapler. The following YouTube video demonstates closing a wound with a Sterile Disposable Surgical Skin Stapler. "Very good product. They stay where you put them and hold on. They are easy to use." "What is not to love? Well packaged with instructions and much easier to use one handed than a suture kit." "Great product for "stitchen" up a wound in a survival situation. Beats needle and thread." "Inexpensive and perfect for teaching the students in my class what skin looks like (pigs feet in this case) stapled and how to remove them afterwards." "Great, large enough that large hands can manipulate with precision." "Part of my emergency first aid kit. Based on some of the other reviews, I have stocked these into a "super-sized" emergency first aid kit." "Stapler saves another $285+ Vet bill. I own hunting dogs (Walker hounds) and from time to time accidents happen and usually it's late on a Friday/Saturday evening. I recently had a dog cut bad enough to need sutures ($285 @ the Vet) to close the wound. This wound reopened ~7days later. With the help of a friend and my "RN" wife, the wound was cleansed and 9 staples were applied, closing the wound, all in the field and right on the tailgate. To put in 9 sutures, a dog would need to be somewhat sedated, but using a stapler it's simply; pinch together/staple, pinch together/staple, pinch together/staple. I'm not advocating this for everyone, but there are many of us that have some medical knowledge/background, like myself that, so I would never go in the woods without them." "I had a bunch of these left over from when I worked in Veterinary Medicine. I have used these on myself for numerous splits and injuries, not to mention on quite a few rugby players. ( Before you throw a fit, I use it only once and toss them. I don't use the same one over again or on multiple people! ) They aren't cheap, and you do waste over half the staples, but figure in the cost of an ER visit or Walk-in and they are well worth it. Plus in a rugby match a couple staples and your back in the game. Much quicker than sutures." 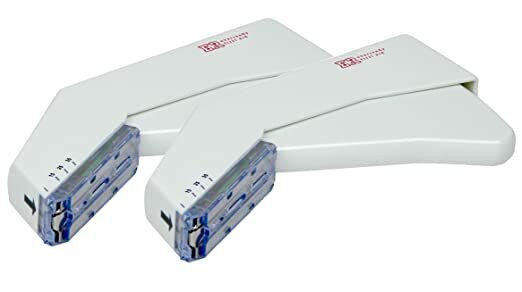 See the Blog (link immediately below) from ThePrepperPages.com for more details from Dr. Ryan Chamberlin concerning using this Surgical Skin Stapler. Dr. Chamberlin includes a chart for when to take the staples out and also has additional tips including how to practice using this stapler. Have a Wound but Super Glue Won’t Work? Use the Next Best Thing – Staples! Use at your own risk. Please note that the information provided on this web page is for information only. TopSurvivalPreps.com and it's owner have no liability or responsibility for anyone using any items described on this web site including the Sterile Disposable Surgical Skin Stapler with 35 Preloaded Staples, skin stapler remover, and other items on this web page.